Borussia Dortmund's Jadon Sancho. John Walton/PA Wire. Rio Ferdinand has urged his former club Manchester United to sign England midfielder Jadon Sancho, with Old Trafford chiefs reportedly already making contact with Borussia Dortmund in a bid to lure the teenage midfielder. Reports in Germany and England in recent weeks have suggested United are ready to break their transfer record to sign 18-year-old Sancho, with Ferdinand convinced he can make a big impact if he seals a move to Old Trafford. London-born Sancho left United's local rivals Manchester City in his search for first-team football in the summer or 2017 and has emerged as one of the shining stars of the German Bundesliga this season. "I would take him at United all day," Ferdinand told Goal.com as he spoke about Sancho. "English, young, hungry and talented, that's all I need to know. "I have known Jadon since he was a kid, knew him through friends. I have known his family since he was a kid, before he was even born. "He has got the right mentality. The mentality is a big part of it all, whether he has the physical attributes or not remains to be seen as he is still young. "The kid's mentality to leave Manchester City, who wanted him to stay, to just say 'My ability deserves it and I think I can play straight away, right now. I am not waiting'. And he has gone and done that. You have to respect that. "So if someone asked me whether I would take Jadon Sancho at United, with all due respect to Borussia Dortmund, I would say yes, 100 per-cent." 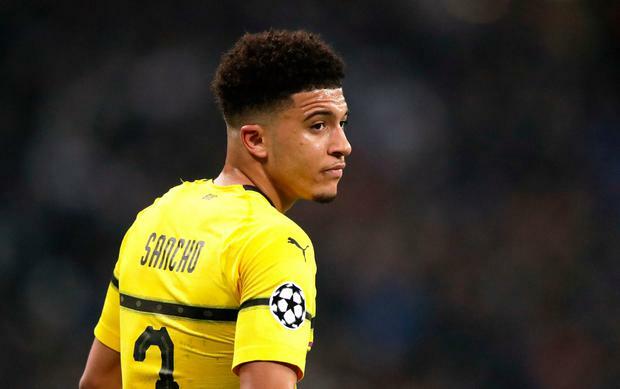 Sancho has been rated as one of the brightest prospects in the game after a season of sparkling performances for Dortmund in the Bundesliga and Champions League, with the chase for his signature likely to be one of the big stories of next summer's transfer window.